Last year, I published a small special page on my website, in which a few of my favorite fonts were displayed each with a specimen picture. However, this was not scalable, and was limited as an extension of my personality. Then I have been thinking how could I make it more useful, and competitive among all products of typography theme, especially those developed by foundries and distributors. For a utility product, I do not have sufficient technologies, compared with WhatTheFont by MyFonts. For a database product, I do not have sufficient data, compared with FontSquirrel. For a media product, I do not have sufficient influence, compared with FontInUse. My resources were very limited, and I could hardly cut into the mature market. At last, I thought, my product must be small-and-beautiful, for that was the only chance. Its value for the users must not rely on data coverage, cutting-edge technologies, or update frequency. And the concept of displaying a random font was almost obvious, as confronted these requirements. 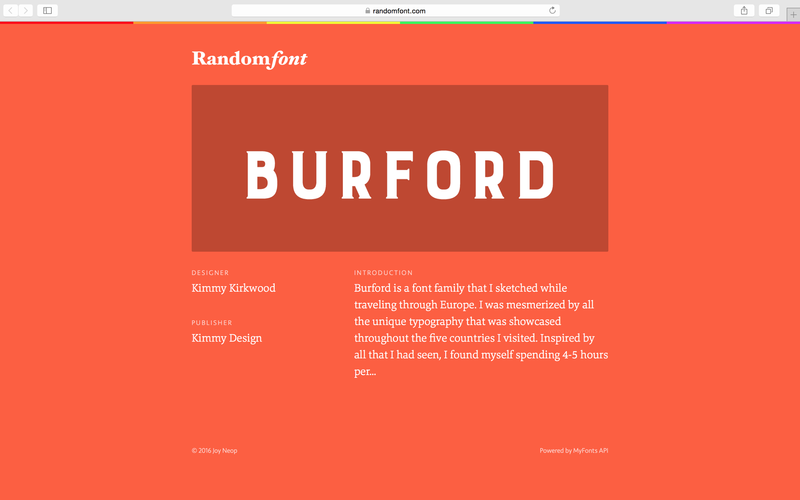 RandomFont came online in April 2016, but I hesitated to show on Designer News. Each sample image contains a purchase link to MyFonts and they are all under my referral link, it might subject to the risk of being considered spam. But not before sharing on Designer News has it received so many visitors and page views; not even the days since shared on Product Hunt. Speaking of the absence of a “refresh” button, probably it does contribute to PV/UV ratio significantly, although this metric was not the intention. Instead, the essence of randomness is the uncertainty and absence of choice; if there is a “refresh” button, the perceived randomness will be reduced, and the users may feel that they can keep refreshing until getting a font for a particular criteria, while the “getting another” operation is separated into “page reload” and “in-page refresh”. As I shared on Designer News on June 26, RandomFont has been shared on other similar media and Facebook pages several times, and has received over 7500 unique visitors and over 33000 page views in a week (Google Analytics). I am so excited about the performance of this little product. I never imagined RandomFont could have reached such popularity, although it is a retention fatal not to have a Chrome extension available when the visitors arrive. Thanks for all who visited, shared, and loved RandomFont. I jump over the lazy dog; it doesn’t hurt me.